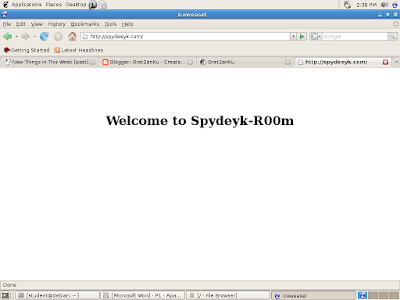 Its usually we used http://localhost in our box, how about make a different things with a domain name like http://spydeeyk.com in our box?? We can do that.., its called Virtual Host. edit /etc/apache2/conf.d/virtual, write NameVirtualHost * , then save! 3. Copy /etc/apache2/site-available/default to make a backup. DocumentRoot /var/www/ --> Change to whatever..
<Directory /var/www/> --> Change to whatever..
Let's check it at browser..
hahaha,.. hasil jerih payah ngelab pagi-pagi di kampus tertuang semua disini ya,..
oya kalo di windows bisa nggak ?! localhostnya di ganti juga ? !